If you are a fan of Bon Scott era AC/DC (1974-1979) then you will not believe your ears! Soul Stripper are a musical tribute to the roots of the biggest hard rock band on the planet and are guaranteed to provide an explosive show that you will not want to miss. Soul Stripper band members have worked tirelessly to achieve the most authentic sound of the early AC/DC days. They accurately reproduce that unmistakable raw guitar sound with a solid rhythm section which never fails to pack a punch. What Soul Stripper provide is a rare opportunity to hear the classic sound that propelled AC/DC from an ordinary Australian pub band to international success with a set that includes the big hits, Whole Lotta Rosie – Let There Be Rock – Touch Too Much and Highway to Hell as well as the more obscure Bon Scott classics like Night Prowler – Up to My Neck in You – Gimme a Bullet and Down Payment Blues. This is one AC/DC tribute you will be telling your friends about for a long time to come. Soul Stripper are in high demand for their tribute shows and are constantly playing all over the country, having have built up an admirable reputation for what they do and are always re-booked! Regulars on the festival circuit Soul Stripper have headlined festivals in England, Wales and at the Isle of Man TT. They have played on line-ups alongside many esteemed rock artists such as Status Quo, Hawkwind, Saxon and Tygers of Pan Tang. 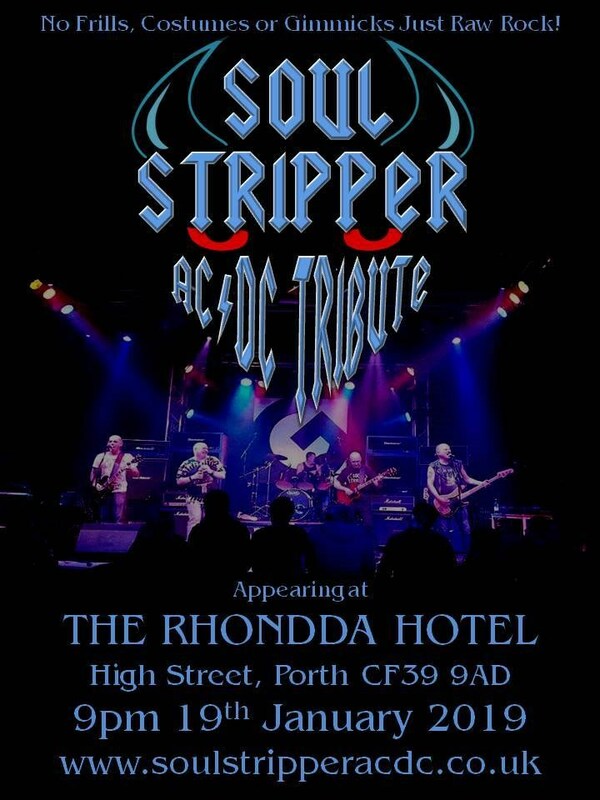 So why not come and ride the Highway to Hell with Soul Stripper and Let There Be Rock! With support from King Kraken. Original Band , You'll know all the members from (Boom Sons, Deadwood,Pilgrim & Psycho Kiss). Please note all shows feature flashing lights/strobe effects.